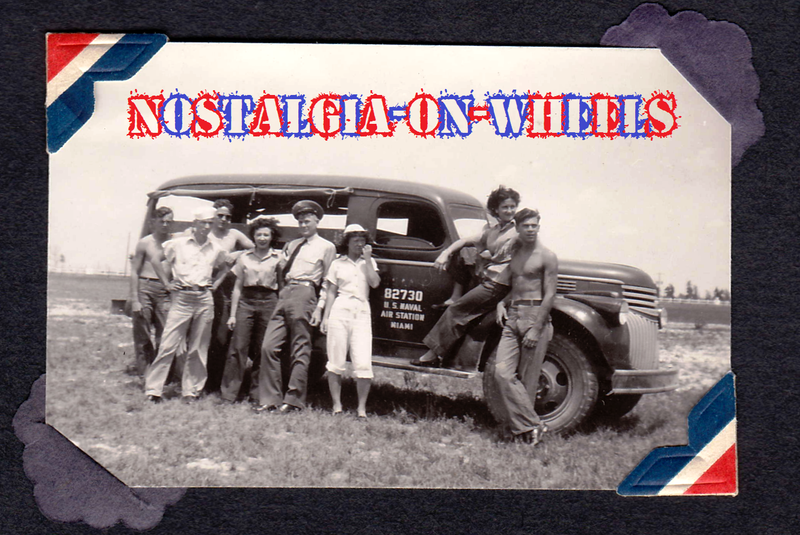 Nostalgia on Wheels Shoppe (on Etsy) - Check it out! 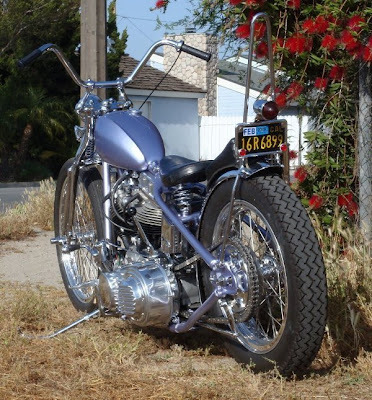 Here's another shot of the knuckle all finished as sent over by Rene of Australia and as originally posted on Radball's blogsite! 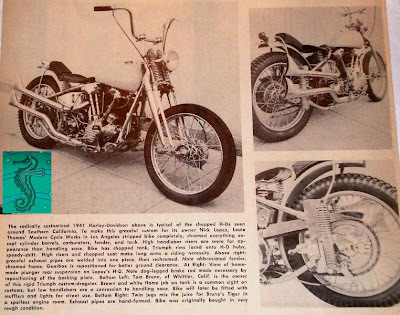 Wow, here's the same handlebar set-up as shown on a 1960s customized pre-unit and as posted on the Church of Choppers blogsite! 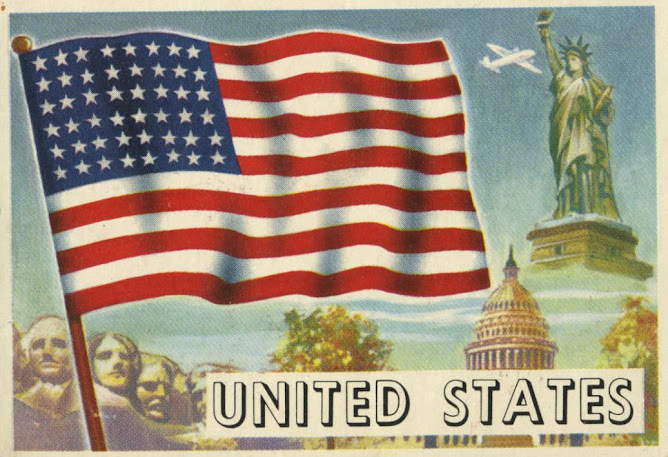 Very cool indeed! 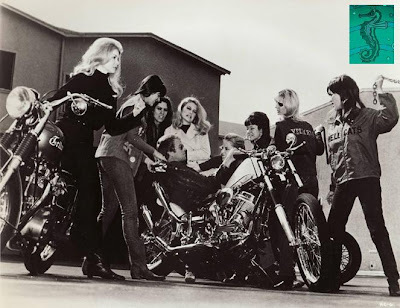 Another great shot of the pre-unit from above from LIFE Magazine from Google Images online! 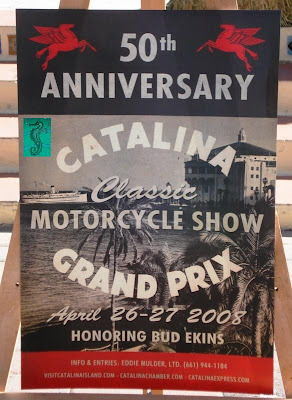 A Little Catalina Grand Prix History! 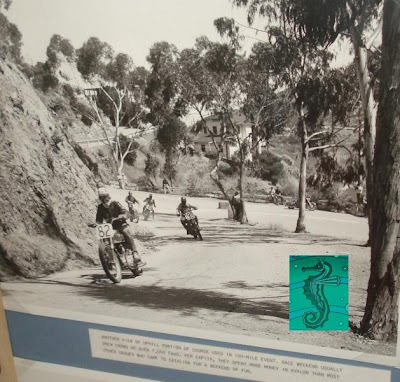 The Catalina Island Musuem, located in the 1929 Casino Building, had some great info on the Grand Prix, including this information sheet! The pre-race crowd! Wow, what a gathering! 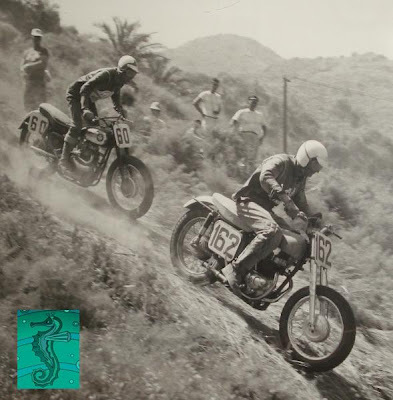 Here's a portion of the uphill course. 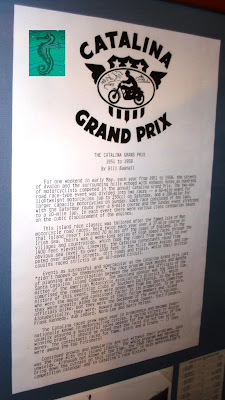 As you can read, the GP race brought 7,000 spectators; insane! 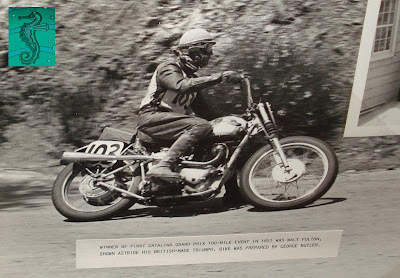 Fulton taking the corner. 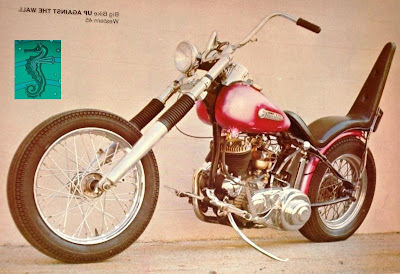 Notice the high pipes and sprung hub! 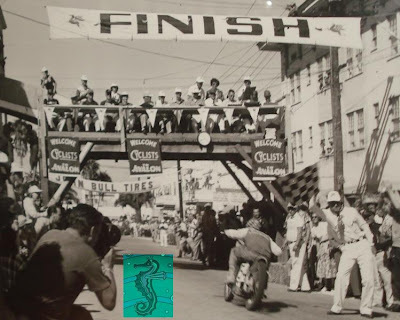 Though this picture is unrelated its from the 50s and kind of fits; who know as she could have been a trophy girl too. 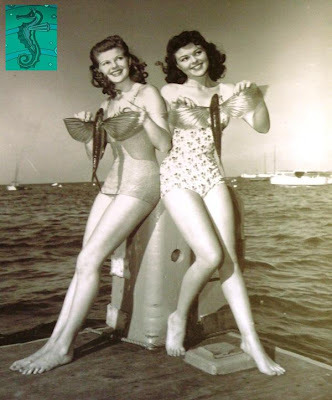 Nice pin-up shot with girl holding flying fish from a Catalina store! 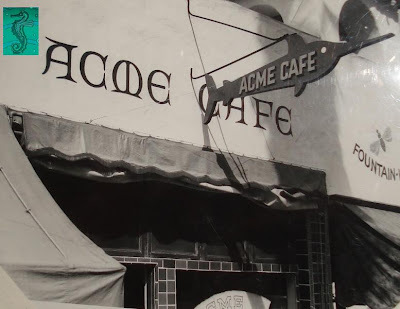 This is probably where you'd eat in Avalon during the 50s. 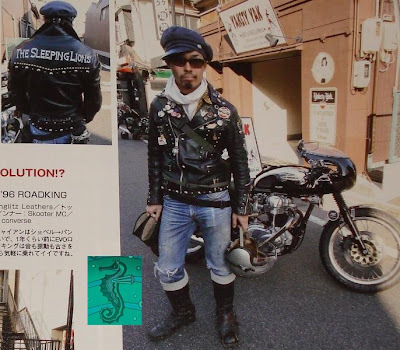 Again its unrelated but I dig the swordfish sign and lettering! 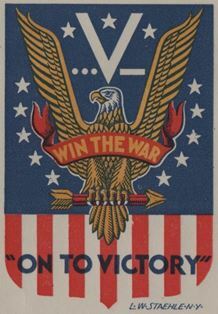 Event flyer posted on an eisle in Avalon. 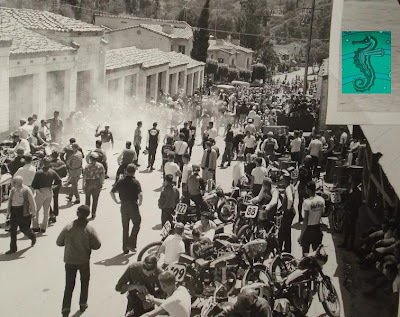 Nice picture of Bud Ekins on the Catalina GP pictureboard displayed in the heart of downtown Avalon. 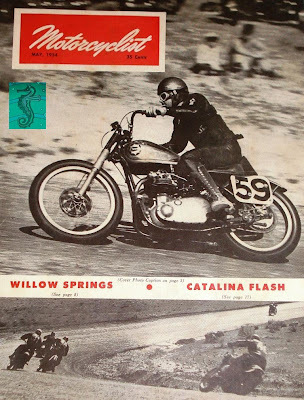 Walt Fulton took home the cake in 1951! 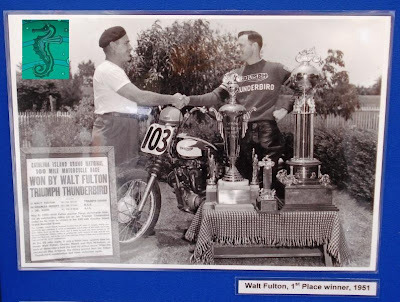 The original 1951 trophy was a nice compliment to the photo above! 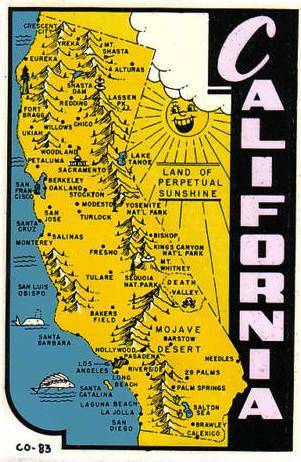 You can see Avalon Harbor in the background! 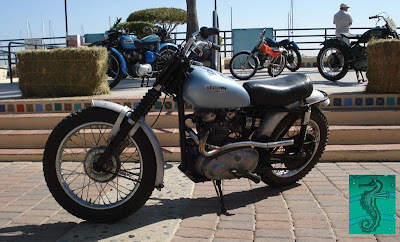 There were three lightweights on display but this 1954 Tiger Cub was the nicest as well as the oldest bike out in Avalon! 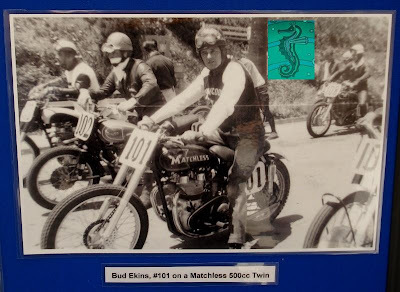 This replica of Bud Ekins' 1955 TR-5 was running one of Ekins' original rear tires, a rare Avon trials tire! 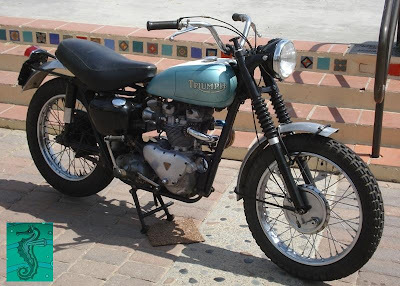 This 1955 Triumph Trophy definitely looked as if it could have been an original Catalina GP racer! 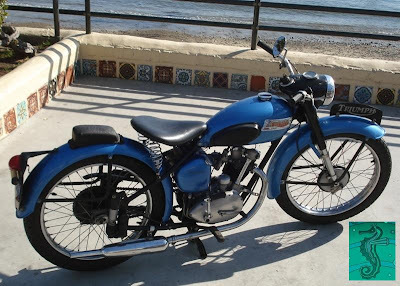 The owner and Catalina resident rode this beautiful 1957 AJS to the bike show! 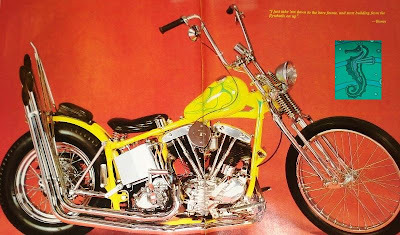 Here's a great Panhead with nicely molded frame and killer stance from a 1968 Gent magazine! 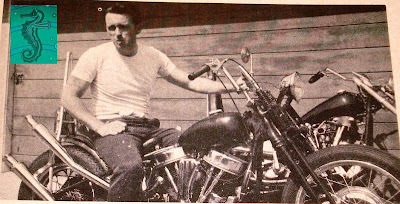 I can't remember which magazine this shot came out of but this Panhead is nice and simple. 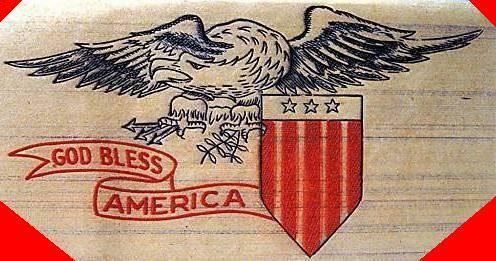 How's this picture? 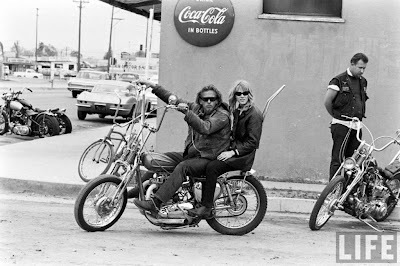 Blonde with eyepatch posing on wild period 45 trike ridden by loco biker dude with pencil-thin stash! Nice. 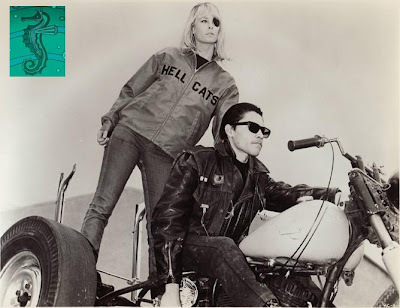 This still and the one below are from the 1968 cheeseball biker flick "the Hellcats" as can be seen on her jacket logo. 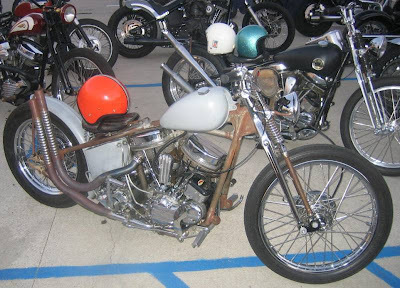 Nice panhead with chrome frame and what looks to be dual linkert carbs. Crazy setup! This tank is beyond awesome! 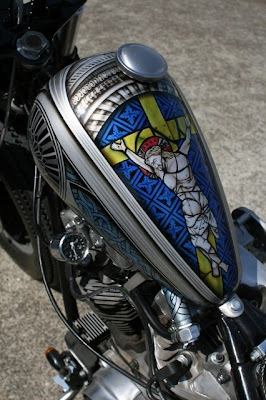 Old Gothic style stained glass Jesus painting on axed peanut tank, simply amazing. 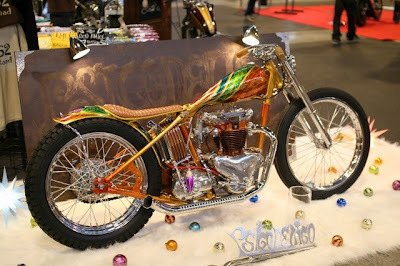 Check out http://www.sparetime.jp/ and click on "PHOTO" for pages of cool custom bikes and riding shots! 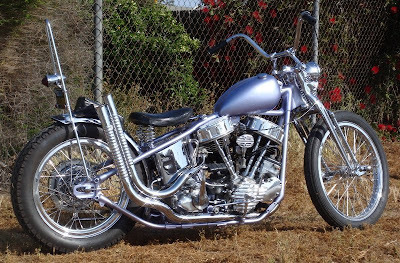 I love this knuckle on Sparetime with the narrowed original tanks! 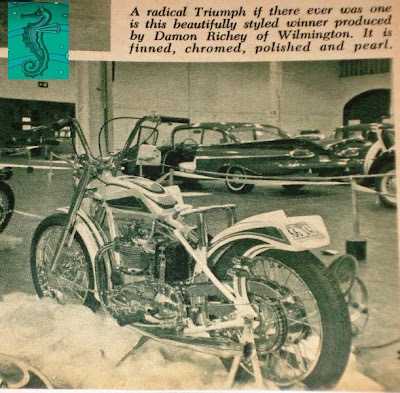 Here's another nice shot of Paradise Road's Rigid Show Triumph! 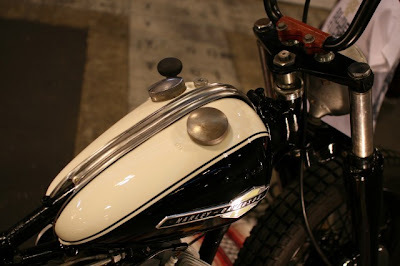 A very nice detailed shot of a pair of stock "narrow" WR Harley tanks! 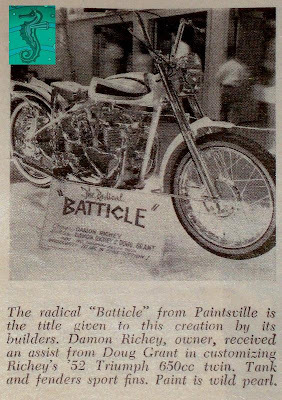 "The Batticle" Show Pre-unit from 1961! 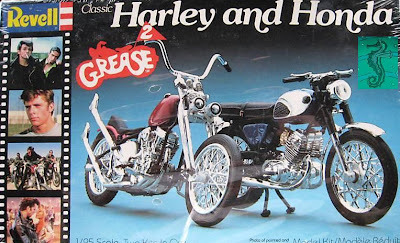 Man, this bike looks as if its ready to fly. 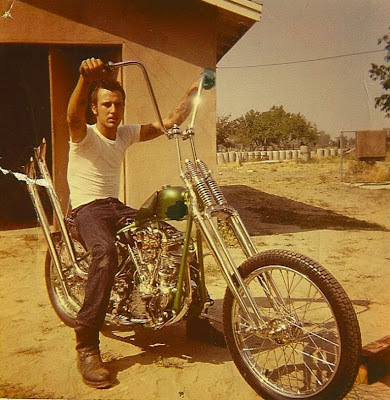 It seems a bit overdone but still very cool for 1961! 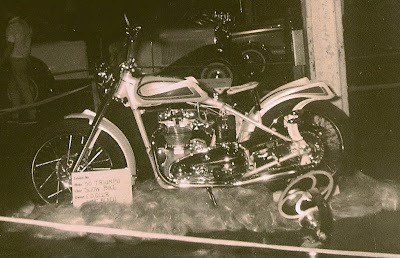 Here's a rad show photo of the same bike as posted by Flathead Jedd on the http://wingnutsmotorcycleclub.blogspot.com/ ! 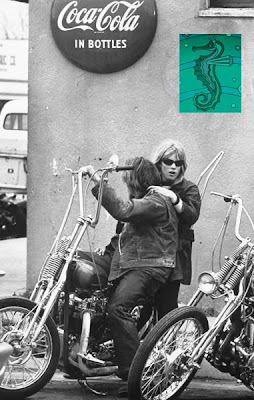 I heard that John Edwards was about to unveil a 60s show bike so gnarly and so perfect that it would literally blow your mind. 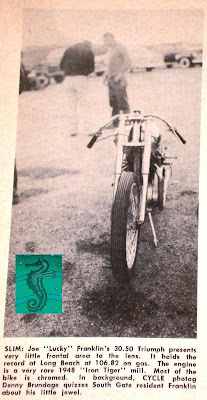 Well here it is, and though I've not seen it in person, these beautifully artistic photos, including about five other detailed shots, are available for your viewing pleasure on Mike Davis' blogsite http://bornlosermc.blogspot.com/ . 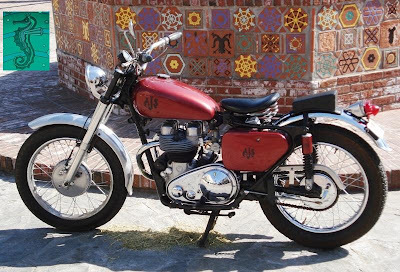 Please check out the photos as this bike is a true gem! Edwards' pan is crazy, wild, and yet not overdone! 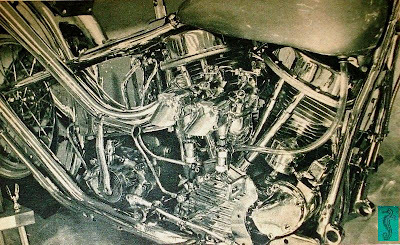 The assortment of rare parts on this cycle is staggering and still everything flows together so nicely. 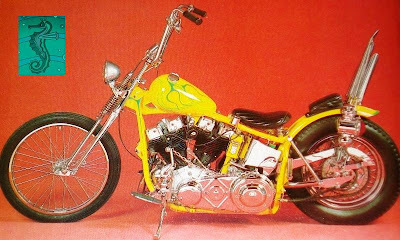 Like in the old Gary Littlejohn article, I'd have to say this bike is also a true "Customizer's Custom." 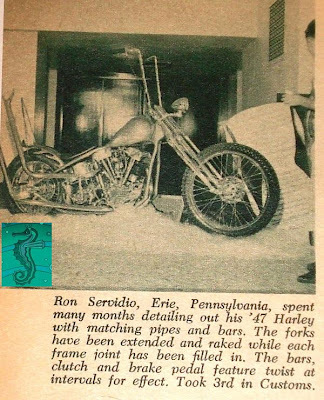 Nice pan/shovel by Bones out of Gabe's 1982 Supercycle Magazine! 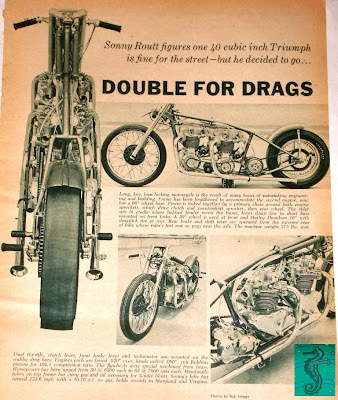 That strutted swingarm frame is pretty good looking. 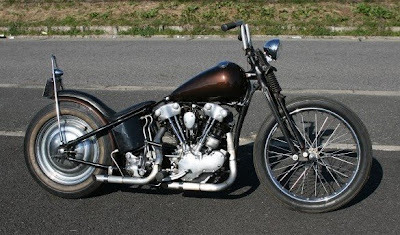 I can't say I've seen too many strutted Harley customs but I dig this one! Nor Cal's Finest, Max & J. Jessee from 2004! 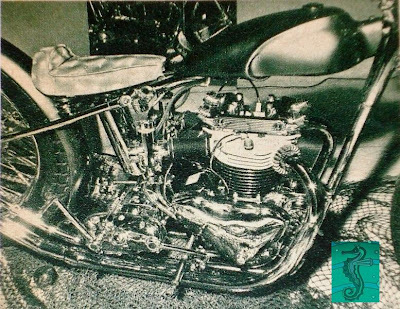 1958 Royal Enfield Show Stopper! 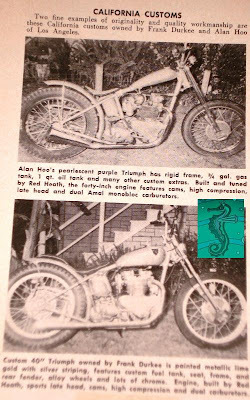 I Heard it Through the "Grapevine"
Johnny Allen's Triumph Salt Racer! 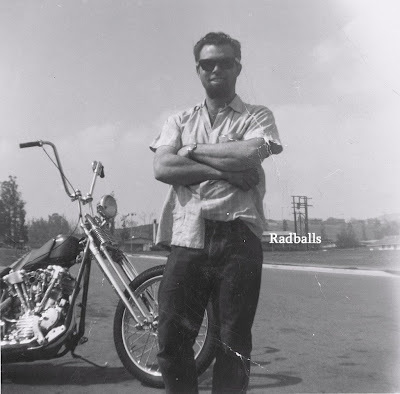 Harley WLA from Down Under! 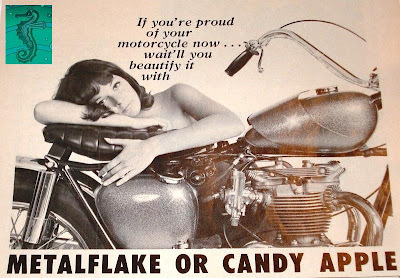 Jackie and I came across some great original 80's punk rock posters today and this one was my favorite of the lot! 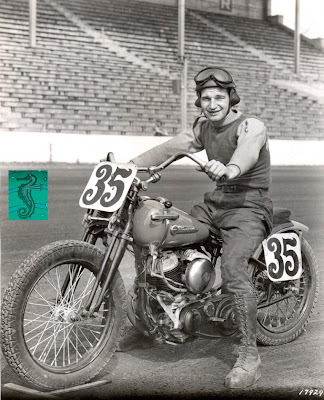 The Bell 500-TX Helmet - Worth its Weight in Gold!!! 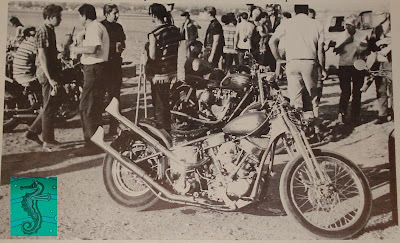 Early 60's Fresno Hells Angels Knuckle Photos! 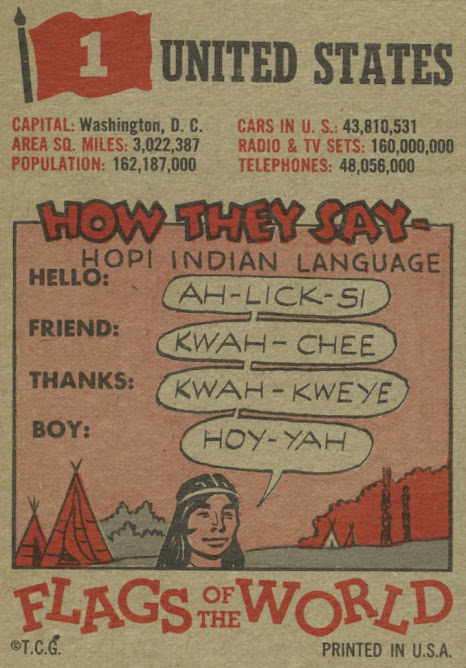 This is some pretty handy information from the Lightning Red Wing Book 2!